This is a shot of Aphrodite - a 74-foot commuter yacht built in April 1937 by Purdy Boats Company in Port Washington for John Hay Whitney - she is seen here outbound from Watch Hill Harbor in Rhode Island this past Monday, July 3. Owner Chuck Royce rescued and restored her in 2005...this remains a sailing blog but sometimes I have to bow to the other side of the aisle. 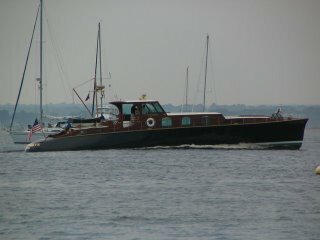 Aphrodite is an utterly gorgeous craft and I felt lucky to have the chance to glimpse her underway. She's been written up in Soundings and Sailing Magazine, though I could not find the articles. A thread here has some nice interior and exterior photos as well as a post from Alan Dinn, grandson of the founder of Purdy Boats (he wrote a history of the yard, Boats by Purdy, in 2003)...he says she can do 27 knots and I believe him! Alan Dinn's book on the boat, "The Many Lives of Aphrodite" has just been released.